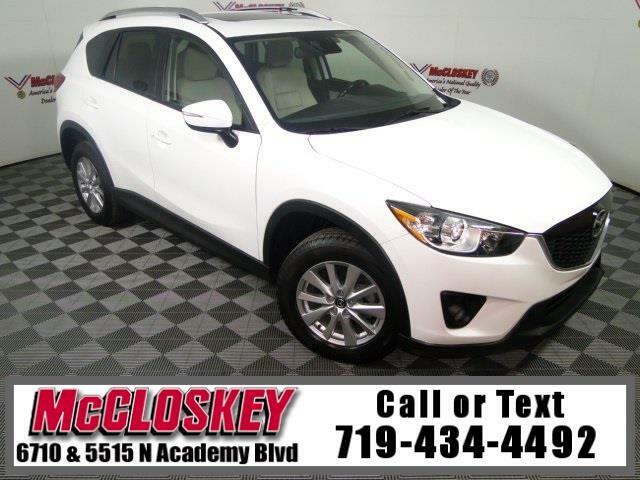 Beautiful and stylish 2015 Mazda CX-5 Touring All Wheel Drive with Navigation System, Power Moon Roof, Push Button Start, Backup Camera, Keyless Entry, and Premium Sound System! The Touring includes all the Sport's equipment and the contents of the Bluetooth Audio package. It also features a more powerful engine, keyless ignition and entry, a rearview camera, a blind-spot warning system, a six-way power driver seat, a 40/20/40-split-folding rear seat, a six-speaker sound system, upgraded cloth upholstery, a leather-wrapped steering wheel and a six-speaker sound system. The 2.5L SKYACTIV engine is good for 184 horsepower and 185 pound-feet of torque!